He ruined her reputation—now she wants nothing to do with him. Brynn Windham loves being a member of the US Ski Team. But after learning a disturbing family secret, she loses her focus and puts her spot on the team in jeopardy. Her coach assigns a skier to help Brynn regain her competitive edge. Unfortunately, the one person who can help her is the last person she trusts. Ryland Guyer might be the heir to his family's sportswear company, but skiing is his priority. As he recovers from an injury, his coach asks him to help another skier salvage her season. The only problem? He and Brynn have history. They haven't spoken in five years, and he doubts she'll want to talk to him now. Not wanting to give up on her dream, Brynn struggles with skiing and Ryland. He wants to make amends for the hurt he caused her and start over, but being around him stirs up old feelings and new, deeper ones emerge. Being on her own is better…safer. But he isn't ready to give up on her. Or them. With a mountain of struggles to face, can Brynn and Ryland learn to forgive so they can reach the top—together? I love this series because each story is different. This is my favorite so far!! Two skiers on the USA national ski team who realize that winning the gold is not their most important goal when love shows up. Ryland and Brynn are perfect together! Exciting, heartfelt, romantic and sweet. My favorite part what the skiing competition and the friendships within the ski team. It was awesome and engaging! Brynn has such heartache from her parents and Ryland. Her parents and especially her mom believe it or not, made me so aggravated. I didn't really care for Ryland at first but the author did a great job of showing us how much he had truly changed before he ran into Brynn again. Don't like when a person changes for another person. The story was about family, going for the gold, forgiveness, reconciliation, and new relationships. I was experiencing all kinds of emotions but the ending left me with a smile on my face. I totally enjoyed reading Brynn and Ryland’s emotional story in Love on the Slope, a heartwarming, sweet romance by Melissa McClone, book four in her One Night to Forever series. Brynn has loss focus and could lose her spot of the US Ski Team after learning a family secret. While recovering from an injury, sportswear heir Ryland agrees to his coach’s request to help Brynn save her season and regain her competitive edge. The problem, Brynn refuses to talk to him after he accidently ruined her reputation five years ago; which means Brynn has no one to confide in. Spending time together, Brynn realizes that Ryland is a changed man, no longer the partier, and that he actually gives her some ideas to re-focus while she competes. Old feelings of her crush on Ryland return and bring about additional ones, stronger than just a crush as Brynn focuses on her future. Brynn was dealt a difficult hand. As the youngest and only girl she was never able to meet her father’s expectations. When a family secret is revealed, things begin to make sense; but keeping it a secret was really too much a burden for Brynn to bear alone. I’m glad Brynn finally trusted and felt safe enough to share the truth with Ryland. I also loved the fact that Ryland cared enough about Brynn to give her options in case she loses her spot on the team. The future is a difficult and challenging path for both Brynn and Ryland, but before they can start they need to find forgiveness for those who hurt them and for themselves. Ms. McClone wrote a wonderfully sweet and moving story that is not to be missed. This story contains fun dialogue, endearing and likeable characters and the magic of love. 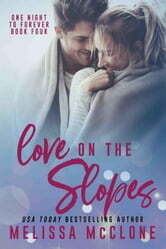 I highly recommend Love on the Slopes to other readers. I voluntarily reviewed a complimentary copy of this book. Olympic hopefuls with a second chance for romance--will they be overcome obstacles to find love while skiing for dreams? Great sports romance! Professional skier Ry wasn’t a very likeable character at the beginning of the book. He only thought of himself and used women as he tried to do with Brynn. He also ruined her reputation when he lied about sleeping with her. Getting injured and almost dying from overdosing caused him to change his life. But he’s still focused on going back to the Olympics and winning a medal. He feels like he can’t afford to have any distractions including women in his life. Brynn is distracted when she is told that the man she thought was her father is not after he insults her and throws her out of his house. She’s been distracted for months about this and her skiing has been affected by it. Ry is asked to help her get her focus back. She can’t stand him after what he did six years ago and she wants to refuse his help, but she knows he’s her only chance at staying on the team. There was plenty of humor, ups and downs with injuries and relationships, and romance in this story. I loved Brynn’s brothers Jax and Ace and hope they get romances in future books. I could see the possibilities with Sam and Lia despite the age differences.